You are here: Home / Sewing & Patternmaking Resources / Do You Want to Make Your Own Sewing Patterns? Patternmaking Made Easy, 2nd Edition by Connie Amaden-Crawford. This book is a great resource. I have a collection of sewing patterns that I’ve purchased over the years. Most of them have never been used. The thought of altering each pattern before I can make it just isn’t appealing to me. I love making my own patterns and I usually want to buy every patternmaking book I see. I bought Patternmaking Made Easy by Connie Amaden-Crawford a few years ago and haven’t felt the need to buy anymore, at least not for patternmaking. The first basic pattern I created using instructions from Patternmaking Made Easy (and patternmaking software instead of pencil and paper) is a skirt pattern (see below). I had to take about 3/8″ out of the waist which was a minor adjustment. Now I can make any kind of skirt I want and I know it will fit. Let the fun begin! My skirt pattern made from instructions in Patternmaking Made Easy, 2nd Edition. 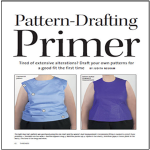 The 3rd Edition of Patternmaking Made Easy is $89 at fashionpatterns.com, which is Connie Crawford’s Web site. It is well worth it to have patterns that fit. And the fact that money is saved that would’ve been spent on patterns doesn’t hurt either. This book will show you how to draft basic patterns as well as add style details. It covers all kinds of garments from a basic bodice to leotards. In my next post, I’ll take you inside the patternmaking software I use to make my patterns. You don’t have to have software to create your own patterns. In fact, you need to know how to make sewing patterns with pencil and paper first so you can tell the computer what to do. 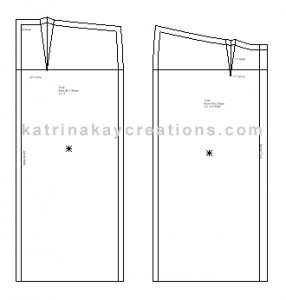 Do you want to make your own sewing patterns? Let me know in the comments. Hi Katrina, I am new to your site, just found you today and just my initial review of your posts has encouraged me soo much. Thank you! In answer to the question in this post yes! I want to learn all I can about making my own pattens. My measurements are 40-35-52.5 and to add to my troubles I am 6 ft. 1 inch tall so you can imagine shopping is just impossible. I started sewing in order to make clothing that fits but am quickly learning that purchasing a commercial pattern does NOT solve the problem. I actually found you from a Pintrest pin I came about where you teach how to adjust your waist to hip ratio by adding length. Can’t say enough how grateful I am that I found your site. I will devour any pattern fitting posts you upload any content or help you can suggest I would greatly appreciate!! Welcome, Sharon! I totally understand not being able to find clothes that fit. That’s the reason I started this blog. I’m so glad you stopped by. If you want to start with very basic patternmaking, check out my post explaining the part darts play in patternmaking. This is part 1 of 3 patternmaking mini lessons. If you sign up, (it’s free), you’ll get a mini sloper/basic pattern to practice everything I teach. It’s a great place to start. Let me know if you have any questions. And again, welcome! Thanks Katrina for letting me be a part of this amazing blog. I would love to learn how to make my own pattern, because there is so many things that I want to make. Thank you, Diane, for stopping by. I’m glad to have you as part of the community. I have 2 blog posts that are an introduction to patternmaking. The links to both are below. I hope they help to get you started. Lesson 3 will be coming soon, so stay tuned. I’ve sewn for years and am quite adept at making adjustments to commercial patterns. However, now that I am a plus size with an asymmetrical body (due to disabling arthritis and back injuries), I’m having a great deal of difficulty working with pre-made patterns and believe that drafting my patterns “from scratch” might be the solution. Please let me know when the ebook is available. Hi Carol, drafting my own patterns has definitely been a solution for me, although I admit I’ve had some fitting challenges along the way. I stopped working with commercial patterns many years ago because of having to make major adjustments, no matter which brand. The patternmaking book I mention above is my go-to for all things patternmaking. It’s an investment, but a great reference book. Connie Crawford now has her latest edition on sale for $89 at http://bit.ly/1AtqBdH if you’re interested. 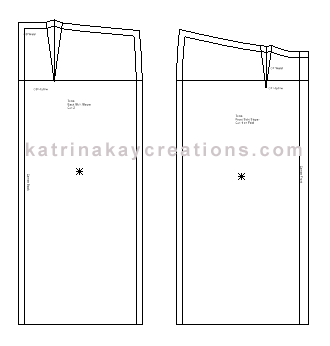 katrina I dearly want to learn how to make my own sewing patterns and also do alterations on my clothes. Hi Diane, I’m working on some basic patternmaking tutorials now. I wish they weren’t so time consuming so I could get them out faster. I had death in my family this week, but I’ll be back in the full swing of things next week to get another tutorial out soon. I also have some clothing alteration tutorials planned. I’m not quite a plus size at present but have been in the past. Thanks for your wonderful tutorials. I have been sewing for many years and have still learned a huge amount. I would love to see any pattern making tutorials you develop. You are so very talented and clearly a very dear person. Thank you, Sandy, for your very encouraging and kind words. I appreciate you watching the tutorials and I’m glad they’ve been helpful. Thanks for spending time on my blog and for your comment. I have been plus size since I was 14, and in the late 90’s when I was in high school the only clothes besides t shirts and jeans I could find where things my grandmother would not be found dead in. So right before I started college I started making my own clothes and most of the time I would end up chopping a pattern up and only using what I needed now I can pretty much make my own patterns with a pencil and big role of brown paper, but your site is teaching me things I didn’t know or at lest putting names to things I have been doing. Just wanted to say that your site is quiet awesome and to anyone who is afraid to start sewing don’t be it’s only cloth not flesh and when you finally get it you will most definitely have a one of a kind creation just like you!! I’m glad you’re finding useful information on my site, Tamy. Your comment put a smile on my face. Thank you so much. I have just come across your neck of the woods. I just wanted to say what a blessing you are to others to have a gift that you are so willing to share with others. I am also new to sewing and have started with something I felt simple. I am wanting to sew for my daughter who has a hard time finding cute things and ends up crying after shopping. Or worse yet crying in the dressing rooms while not so caring smaller sized employs are outside (of the dressing rooms)but still with in ear shot making fun of her. It breaks my heart. So I am going to be a sponge and soak up everything that I can. Hi Kandi, no one should have to go through what your daughter went through in that dressing room. It broke my heart as I read it. This is the reason I share my knowledge. I believe everyone should be able to have a pleasant shopping experience and everyone deserves to be treated with respect. I hope I’ll be able to give you the tools you need to make your daughter beautiful clothes. If you have any questions, don’t hesitate to ask. Which pattern drafting software do you use? I use PatternMaster Boutique Version 5 from http://www.wildginger.com. I’m 27 and I love buying patterns but it’s always limited cause I’m plus size. Also I don’t own a sewing machine and can’t sew. But would love to learn. 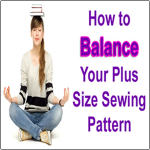 Hi Jouan, there are many online tutorials that are free that can teach you the basics of sewing. It’s a good idea to start with small, easy projects. I hope you’re able to purchase a sewing machine soon and join the rest of us who love sewing. I am a 35 year old plus size woman and I am new to sewing. In fact I have never used a sewing machine. I have brought some patterns and realized afterwards that they aren’t for full figured women. I went back to check out the plus suze patterns and realized they’re just like store brought clothes for big women-ugly! I would love for you to create a free e-book that would allow me to create my own patterns and make my own clothing. I know how you feel, Christina, and I will definitely consider what you’re asking. I love sharing free tutorials and my goal is to also make a living doing what I love-which is teaching patternmaking and sewing. So, hopefully I can give you what you need to get started. I just found your blog today, while looking for some information on ease, as I am adjusting a pant pattern to the style my niece wants. Adjusting a premade pattern is the most I have done so far. I would dearly love to learn to draft my own patterns from beginning to end! Welcome Francine! I hope I can help you draft your own patterns and I’ll recommend any other good resources I come across. It would be wonderful to make clothes that actually fit. Thank-you so much. You’re welcome, Linlaura. I wish you much success in making clothes that fit. I would love to make my own sewing patterns. I am in the process of my first attempt. It has been a long and agonizing process. Yes it can be agonizing but well worth it in the end. I’m working on some free patternmaking tutorials. I’m starting with skirts and then I’ll go from there.